SAME HAT! : UPDATE ON "VIOLENCE BECOMES TRANQUILITY"
The internet is a magical place. I posed a question about the circumstances around the publication of Shinobu Kaze's Violence Becomes Tranquility in Heavy Metal in 1980, and within a few days the exact right person to answer that question came and filled us in! It is known that kaze shinobu is fan of Druillet. I checked that in comipress the manga zombie book. Perhaps because of his storytelling, his unique splash pages and and the bizarre things he does! While the young Kaze was busy creating gag manga with idiot heroes, his collaborators at Dynamic Pro were looking much further afield. 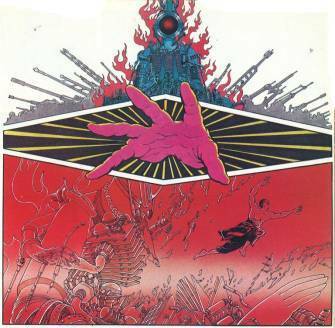 In particular, they were reading the cult French graphic novelist Philippe Druillet. When he looked through Druillet's Lone Sloane, Kaze was blown away by the ultra-intense coloration and 4-D graphics. He wasn't slow to pay homage. His own work immediately started taking on Druilletesque characteristics like the Frenchman's intense sharpness of line. And as he moved away from gag manga, Kaze really started to come into his own as an artist. Apart from that, It is really exciting about knowing the stories behind the publications. One of the best things about manga that was published in the 80s was Samurai Son of Death. It was a collaboration between Sharman Divonno and Hiroshi Hirata. Eclipse published that one. Stan Sakai did the letters for that manga. It is a nice prestige that you can found it very cheap in milehighcomics o mycomicshop. An incredible art. Stan Sakai told some anecdotes about that in his forum. Apart from this, thanks a lot for the researching about cool and underated mangas that you recommend and you talk. It is really very worth to read people who doesnt talk always about naruto and dragon ball!!! keep as always the good work! !